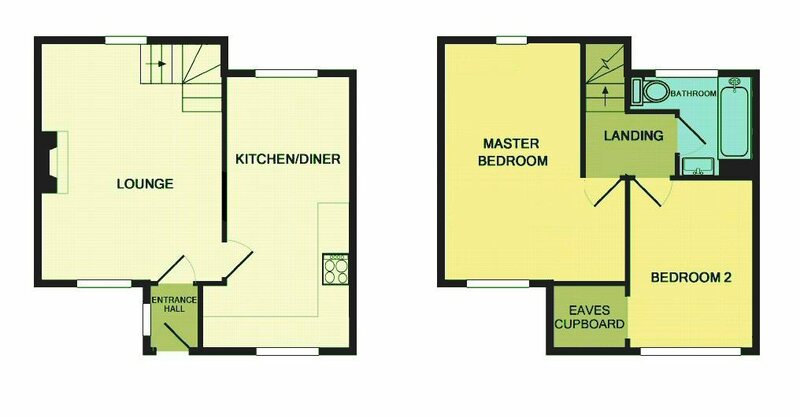 EXCELLENT KITCHEN / DINER 17' 7" x 8' 2" (5.36m x 2.49m) A super dual aspect kitchen with double glazed windows to front and rear. Range of fitted wall, base and drawer units. Integrated fridge, dishwasher and washing machine. Work surfaces incorporating sink unit and inset electric halogen hob with extractor unit above. Ceramic tiled floor. LANDING Built in linen cupboard. Access hatch to loft space. BEDROOM ONE 15' 7" x 12' 0" > 7'3 (4.75m x 3.66m) A lovely master bedroom with dual aspect double glazed windows to front and rear. Dressing area with 3 fitted double wardrobes. 2 radiators. BEDROOM TWO 10' 5" x 8' 2" (3.18m x 2.49m) Double glazed window to front. Radiator. Recessed eaves storage area. BATHROOM White suite comprising bath with hand shower attachment, WC and pedestal hand basin. Storage cupboard. Radiator. Double glazed obscure window. GARDEN TO FRONT An enclosed fenced area with gates onto footpath leading to adjoining countryside. Vehicular right of way. Outside boiler. He can be contacted at our PUCKERIDGE OFFICE on 01920 822999. Please feel free to call him for any advice or quotations required.